Before we get into the details of this recipe: go add six oranges to your shopping list. Do it right now, so you don’t forget–because you’ll want to make this bread, ASAP. And yes, you read that right. This recipe uses a whopping six oranges. You’re mostly using the zest, though you’ll throw a bit of juice into your glaze. Don’t worry about wasting the rest of the fruit–zested oranges last a couple days in the fridge, so you can just eat the rest later. Ok: now onto the details. This bread makes any morning sunnier. It’s like a gooey, soft cinnamon roll, made ten times better by lots of orange zest. It’s definitely sweet and decadent–and the ultimate morning pick-me-up. I compared a few recipes for orange cinnamon rolls before picking this one, and noticed lots of bloggers talking about nostalgia for this flavor combo. I never had Pillsbury’s Sweet Orange Rolls as a kid…but if you did, this bread apparently tastes like that! Give yourself plenty of time for this one. You need to let the dough rise twice, and you’ll want the bread totally cool before icing it at the end. I promise it’s worth it! This was my first time making a pull apart bread, and I really liked how it turned out. It’s easier than doing rolls, and looks really cool once it’s finished. This is the perfect recipe for Easter brunch, or your next brunch potluck…or you can be like me, and bring it to work next Monday. Whatever you do, trust me: people will thank you. Original recipe: How Sweet Eats. I’ve rewritten things a bit and added commentary. 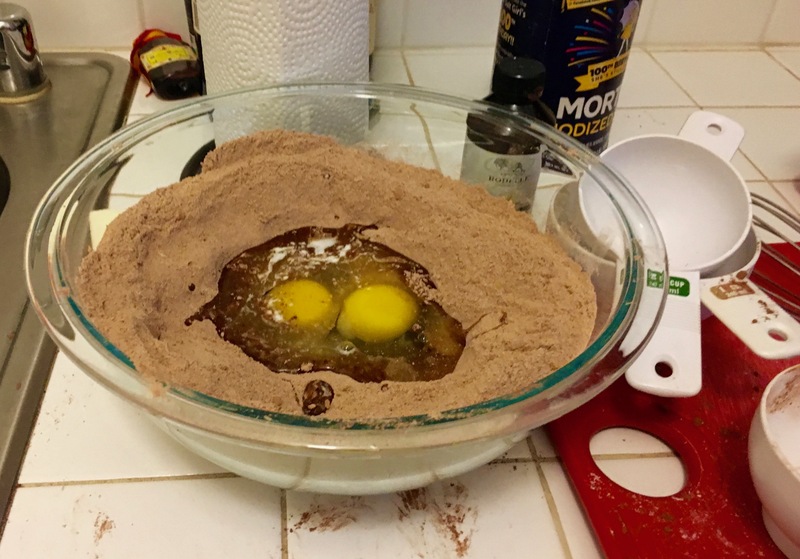 Put the 2 cups of flour, sugar and yeast in your mixer bowl. Use the beater attachment, and stir until combined. Put your milk and butter in a small saucepan. Turn the heat to low, and heat just until the butter melts. Remove the pan from the stovetop, and let it sit for a few minutes. Then, stir in your water and vanilla. Attach a dough hook to your mixer bowl. Pour your butter mixture into the flour mixture. Mix until everything is just combined. Add your salt and eggs, one at a time. Beat well in between each addition. Add your orange zest, and beat the dough again. The dough should be pretty sticky at this point. Add your remaining 3/4 cup of flour in small increments, beating another 2-3 minutes. You’ll know you’re done when the dough comes together again. It should still be pretty sticky! Oil a bowl, and place your dough inside. Cover the bowl with a towel, then leave it to rise in a warm place. It should take about an hour to rise–check to make sure it’s poofed up before you move onto the next step. Once your dough has risen, prep your workstation for the next step. Flour a flat surface that’s large enough to roll out the bread. Punch your dough down, then turn it onto the floured surface. Roll the dough into a large rectangle. The original recipe said 12×20 inches, but mine stretched slightly smaller than that. Brush your dough with the melted butter. Cover that with sugar, cinnamon and orange zest. Try to spread the filling evenly. Stack your dough into six stacks. Brush a 9×5 loaf pan with melted butter. Put your dough stacks into the pan, then smush it together. Make sure to press the dough together well, so it sticks together while baking. Cover the pan with plastic wrap, and let it rise for another hour. Bake the bread for 30-35 minutes, until the top is golden brown and set. I ended up tenting mine with foil near the end so I could keep cooking the insides without burning the top. Let the bread cool for 10 minutes before moving onto the glaze. Note: I only used half the icing. Adjust based on how much glaze you usually like! 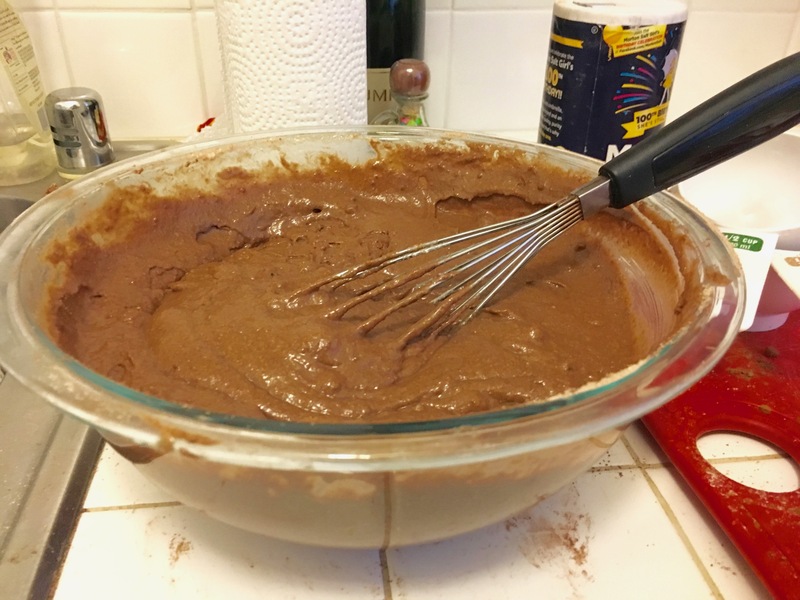 Whisk all icing ingredients together until a glaze forms. It should be pretty smooth–if it seems thick, add more orange juice 1 tsp at a time. If it seems to thin, whisk in a few more tablespoons of sugar until you reach the right consistency. Drizzle glaze all over your bread. It’ll end up in some of the bread pockets…mmm. This definitely is best served warm, but it tasted great after it cooled, too! Sometimes you have extra rosemary sitting around from a recipe you made for dinner the night before. And while you could go look up ideas for another dinner recipe that uses rosemary…why not just make pancakes instead? That’s how these pancakes came into my life. I happened to have extra rosemary, oranges and milk. None of those things are typically in my kitchen so really: these pancakes had to happen. Right then, right there. These pancakes are a scrumptious brunch treat that’s great for a slow Sunday, Easter brunch or any other time you have a hankering for pancakes. Which, at least in my world, is a pretty regular occurrence. The ricotta gives the pancakes a fabulous, pillowy texture and the orange/rosemary combo is a really nice pairing of fruit with a more herbal flavor. These require a few steps to get breakfast on the table, but it’s worth it. You need a bit of lead time, because step one is infusing your milk with the rosemary. Steeping the rosemary in milk gives your pancakes a subtler rosemary flavor than if you folded bits of rosemary into the batter itself. This recipe also requires you to whip egg whites to medium peaks. That doesn’t take very long, but you do need to pay close attention to get your peaks justtt right. Thanks to this wonderful internet thing, I’ve found some great egg white tutorials, like this visual guide from The Kitchn. The original recipe calls for a lavender whipped cream topping. We didn’t do that part (a.k.a. I didn’t have any lavender sitting around) but it sure sounds delicious! Original recipe: This is a Sweet Blog. I’ve rewritten things a bit and added commentary. Yield: We got 8 pancakes out of this, but your yield obviously depends on how big you make your pancakes! Chances are good that you have some extra molasses sitting around from holiday baking. Molasses keeps for a while but… why let it crowd your shelf? Why not make gingerbread waffles instead? I’m a big believer in gingerbread, and think its flavors work everywhere from breakfast to dessert. In this recipe, molasses is the star. You add a good number of spices, but the final waffle really gives off a rich, molasses taste. It’s intense, and satisfying, and delicious. You’ll need to play around with your waffle iron a bit to figure out the right combo of settings and timing. My iron has 6 heat settings, and I turned it to 3.5 for these beauties. I also discovered that the waffles crisp up as they sit, so don’t worry if your waffles don’t look fully cooked when you take them out. Original recipe: Smitten Kitchen. I’ve rewritten things a bit and added commentary. Yield: We got 5 waffles out of this. Use my pictures for reference, since every waffle iron is different and the iron affects yield. 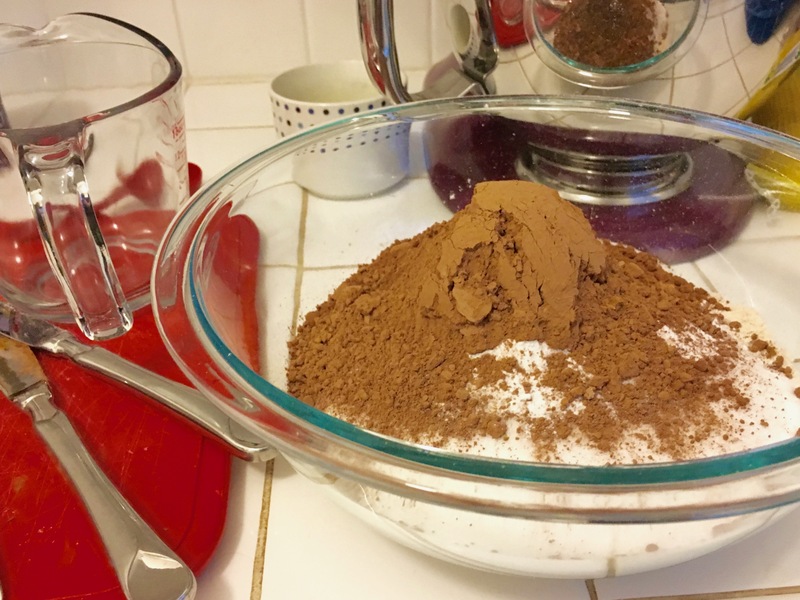 Use a large bowl to whisk your flour, cinnamon, ginger, cloves, nutmeg, baking soda and salt. If you’re using dry buttermilk, this is when you’ll add your powder, too. 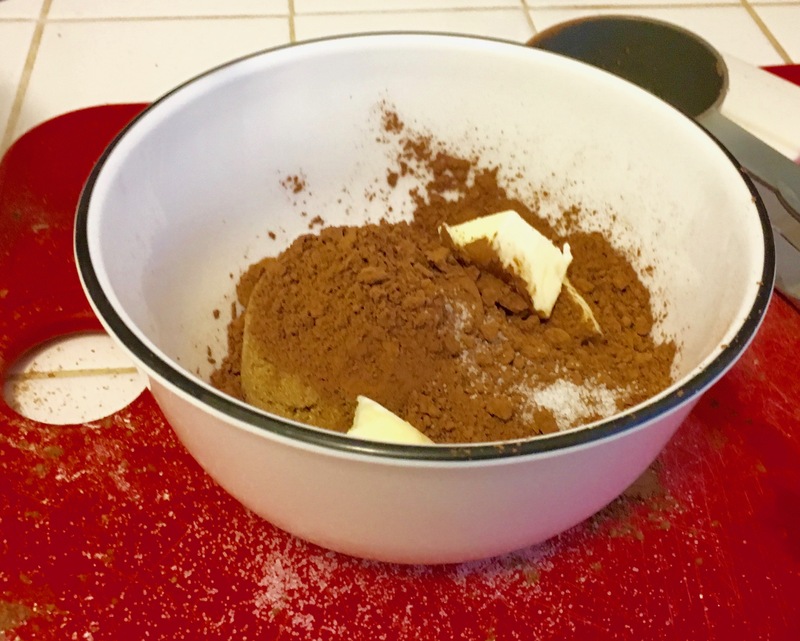 In a medium bowl, whisk your buttermilk, molasses, brown sugar, granulated sugar, egg and butter. Whisk until it looks fully combined. Your butter might firm up a bit and make white splotches in the batter–don’t worry about it! You can dust these lightly with powdered sugar, or dunk them in maple syrup. They really don’t need any topping at all: they’re so delightfully rich and flavorful on their own! Highly recommend a liquid measuring cup for molasses! Every January 1st, I make sure to have a special breakfast. It’s a relic of childhood tradition–and a delicious tradition, at that. Growing up, we went to the Rose Parade every single New Year’s Day. We’d get up at the crack of dawn and drive to Pasadena to make sure we got a great spot on the route. The parade is a fabulous spectacle of floats and entertainment. The floats are an incredible sight: often quite complex, and completely decorated with seeds, nuts, fruits and plants. Our tradition didn’t stop at the parade. Naturally, there were traditional foods, too. Every December 31st my mom would bake up a storm so we’d have plenty of treats to enjoy the next day. The annual menu included zucchini bread, applesauce bread and oatmeal chocolate chip cookies. We’d start nibbling on the goods as soon as we sat down at the parade route, and it definitely helped time fly by as we waited for the parade to start. Beautiful floats, great bands and cookies. What’s not to like?! I haven’t been to the Rose Parade in years, but I still think January 1st deserves a special breakfast. 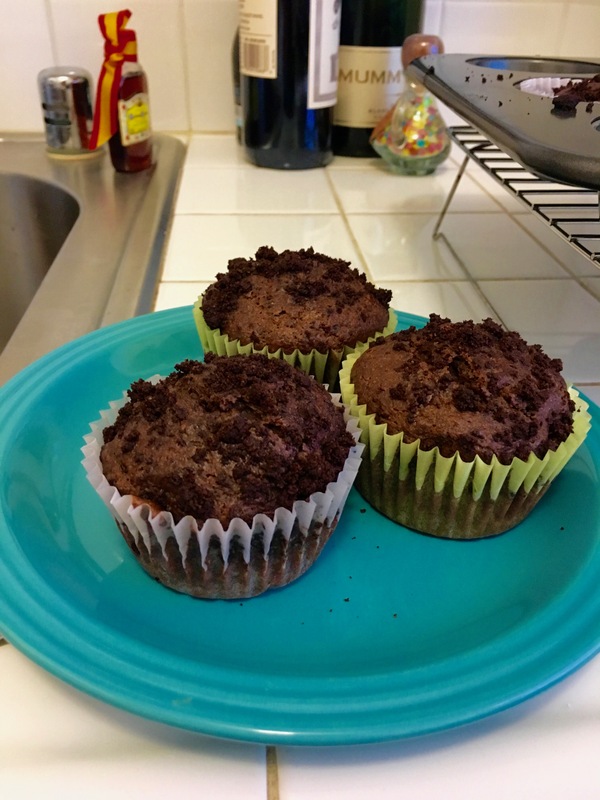 This year, it’s going to be these delicious, fudgy chocolate muffins. They’re simple and don’t require any special equipment… so you could probably make them even if you’re in a, well, less than perfect state come the morning of January 1st. Or, make them the day before! These keep pretty well thanks to the moisture ricotta brings to the batter. These muffins definitely don’t fall into the genre of “muffins pretending to be healthy” (though they do use whole wheat flour). They taste a lot like cake, and look a lot like cake too. They’re dense, fudgy and moist. You add ricotta right into the batter, along with a heap of cocoa. 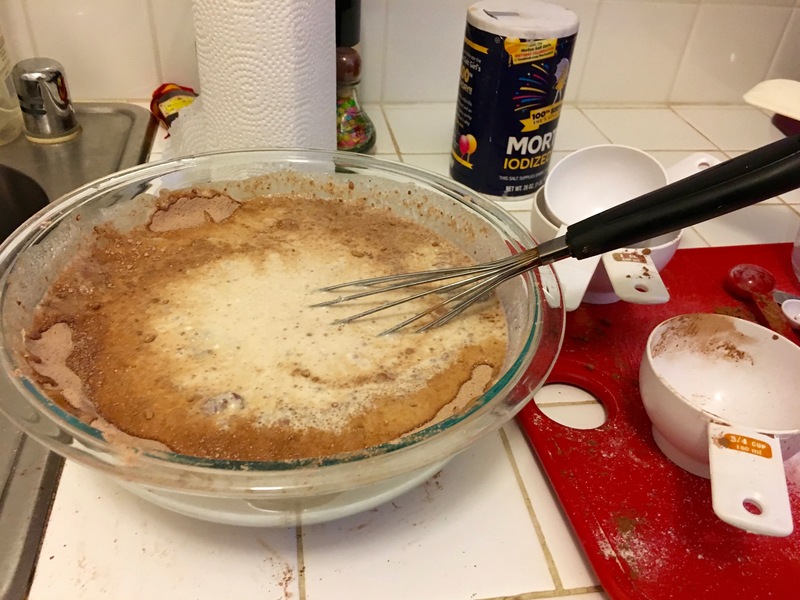 And a streusel topping adds a crumbly bit of sugar and cinnamon to every bite. If you can’t get to these for January 1st, fear not. They’re a great “just because” breakfast whenever you have the craving for something a little special to start your day. Original recipe: Vegetarian Adventures. I’ve rewritten things a bit and added commentary. 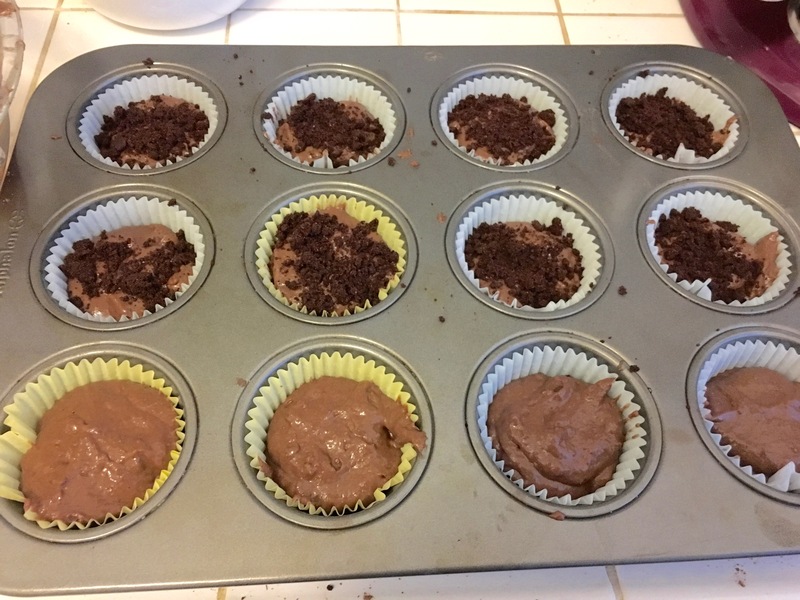 Yield: ~24 muffins. The original recipe says it yields 16 but I got way more muffins out of this! I don’t make enough breakfast treats. It’s just sort of hard to pull off these days. My current apartment is too small to host the seated breakfasts and brunch potlucks of yesteryear. And getting up to bake before work is… hard. But! A couple of weeks ago, I did it! I woke up early on a Monday and baked these Apple Cinnamon Crumb Muffins to share with coworkers. I had a string of morning meetings that day, and thought muffins would add a nice touch. Because obviously, meetings are better with muffins. I found this recipe when I was digging around for ways to use up a bag of Granny Smith apples. I don’t like eating Granny Smiths on their own so when I have them, they’re destined for baked goods. This was a good recipe pick, for sure. The muffins use a mix of whole wheat and all-purpose flour, and buttermilk helps give the batter some depth. You can mix in apple variety you have on hand. The muffins are finished with a delightful cinnamon crumb topping, adding just the right dose of sugar to complement the whole-wheat-ish base. 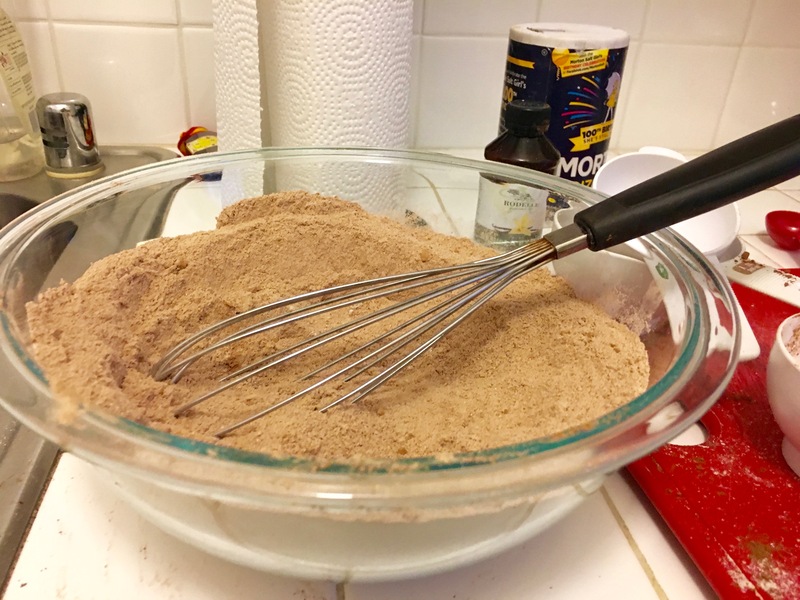 I don’t typically stock whole wheat flour in my pantry, so I had to buy some for this recipe. Fear not: I already know what I’m going to do with the rest of the bag. 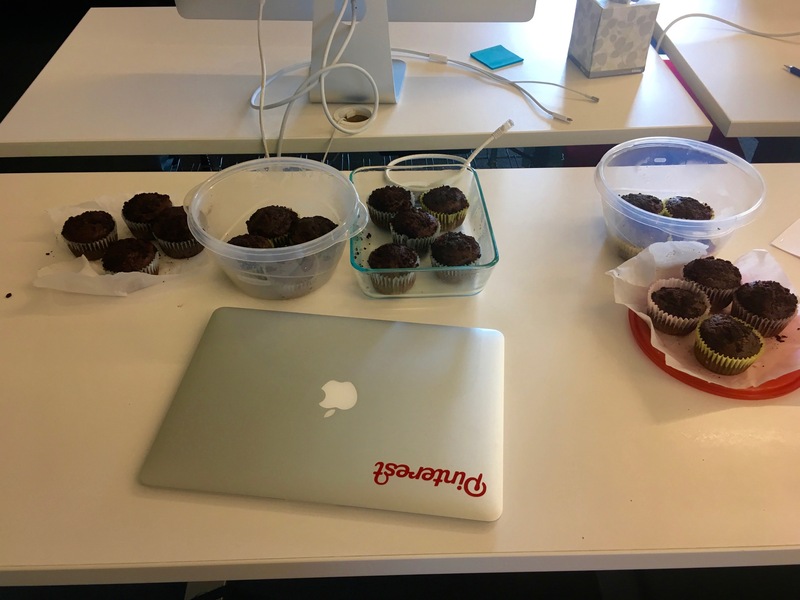 My coworkers seemed to agree that morning meetings are better with muffins, so I’ll definitely try the wake-up-to-bake routine again soon! Original recipe: Two Peas and their Pod. I’ve rewritten things a bit and added commentary. Pour your wet ingredients into the dry ingredients, and mix with a wooden spoon or spatula just until it’s combined. You don’t want to see any powder specks, but don’t overmix, either! Dry buttermilk is such a great baking hack! This is another story of my coffee addiction fueling a new bakery addiction. One of my favorite San Francisco coffee shops is this little place called Contraband. It’s in a cozy corner of Nob Hill, and it’s the type of place that just oozes a community vibe. It’s small, but always feels lively, and has huge windows bringing in some of the city atmosphere. My boyfriend and I spend quite a bit of time there- in fact, I’m nursing their delicious Black Market blend right now. A year or so ago I tried one of their pastries and was so wowed by it, I immediately asked where it came from. It was this delicious savory tart, with the perfect blend of vegetables and cheese on top. They told me it came from a place called Neighbor Bakehouse in the Dogpatch neighborhood. I added Neighbor to my San Francisco “to do” list… but somehow never made it there. Fast forward to last year, when I moved closer to Contraband and started going there more. My boyfriend has gotten hooked on their ham and cheese morning bun, while I’m hooked on seasonal iterations of that delicious savory tart. And so last week we decided it was time to right a wrong, and finally made it to Neighbor. We planned an entire Sunday Funday, with Neighbor slotted as the first stop. Between us, we got 5 different things: the Everything Croissant, the Twice-Baked Pistachio Blackberry Croissant, the Ginger Pull-Apart, the Mushroom Tart, and a croissant that had smoked trout/cream cheese inside. Yes, 5 pastries for 2 of us- we’re such diligent researchers! We thought everything was wonderful, but we did have some favorites. My favorite was definitely the Pistachio Croissant. It had this great crunchy texture on the outside, but perfect buttery layers on the inside. Most nut croissants have pastry cream inside, so I expected a pistachio cream but was actually pleasantly surprised to find that the filling was more like a paste. The employee we spoke to explained that they mix the pistachio cream with a type of flour, so it creates a distinct texture. They then lather in blackberry jam, too. It is the perfect treat: a standout croissant plus this unique blend of nut flavor and fruit flavor. We couldn’t stop raving about it the whole day after we finished! My boyfriend’s favorite was his Mushroom Tart. Neighbor does base doughs so well. And while that may sound like a given to you, it isn’t- a lot of bakeries disguise mediocre base doughs with lots of add-ins or other flavors. You can taste the quality in these pastries, because every bite tastes outstanding. Whether you get a bite with Mushrooms or just the pastry base, it wows you. I realize this sounds very hyperbolic but trust me- you have to try their flaky doughs to see what I mean. I think I liked it more than Arcade in NYC, actually. After finishing our pastries, we walked 5 miles wandering around San Francisco. Let’s just say that makes up for eating 5 pastries, ok? If you’re ever in SF, I recommend checking out Neighbor. Make sure to plan ahead: they’re only open Wednesday-Sunday, and they close by noon. Their space is more bakery than cafe, so they only have benches outdoors rather than indoor seating. We enjoyed sitting there on a lovely SF morning, and found it very relaxing. Neighbor is actually really accessible by car and transit here, so if you’re visiting, you could definitely make it work. I suggest going there for an early breakfast, and then spending some time exploring the pleasant residential/commercial streets nearby. You can also walk all the way north on 3rd until you hit the ballpark; then take Embarcadero the rest the way up toward downtown. By the time you get to Market Street you’ll be ready for lunch- and then the goodies at the Ferry Building are perfectly positioned for your next meal! We will definitely head back to Neighbor to try more of their great assortment of savory and sweet items. In the meantime, since we couldn’t make it there today… we got a morning bun and croissant at Contraband! The combo of Neighbor pastries and Contraband coffee is a marvelous way to start your day. Fun facts: If you’re worried they will run out of something specific- order ahead. You can email orders of any size to pick up, as long as you give 72 hours notice. We didn’t end up doing this but I did consider it since I really wanted to try that Pistachio Croissant!